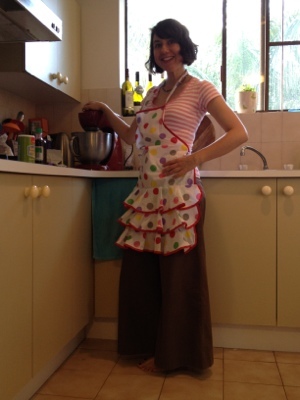 I thought the cuteness of this apron might rub off on my cookies. The power of fashion is far reaching and can cross dimensions to share its power with other objects! Posted in Brisbane Fun, casual, Dogstar, fashion and tagged Baking, fundraiser, spring, the power of fashion. Bookmark the permalink. I have a couple of crazy ones because I think you are right…mood can change your cooking and fashion can change my mood so there is an obvious connection! Just helping out a friend going to a formal do and was explaining the importance of formal hair to get you in the mood and help you remember you’re wearing you’re special dress! However, now I am looking forward to a holiday in Spain. We leave in a month and I can’t wait to bask in the sunshine! Oh how lovely 🙂 sounds perfect. I keep forgetting how cold it is in Melbourne! Thank you 🙂 and thanks for checking out Fashion Mashie! Is your pic a cake that made? It looks amazing!